Warren dismissed questions that invoking constitutional remedies would provoke a constitutional crisis. Of course, she did, because this constitutional crisis is a manufactured one by those such as Warren. It’s nothing short of a coup plot. Warren suggested that the opinion piece, in which someone identifying as a senior official at the White House called Trump “amoral” and “anti-democratic,” warrants invocation of the 25th Amendment. And just like that… Warren suddenly believes in the Constitution. “If senior officials believe the president is unfit, they should stop hiding behind anonymous op-eds and leaking information to Bob Woodward boasting that they’re trying to save our country,” Warren wrote. At least we agree on that point. Let’s be clear: We already have a constitutional crisis if the cabinet believes the President of the United States can’t do his job and then refuses to follow the rules that have been laid down in the Constitution. They can’t have it both ways. In the Times’ opinion piece, the author claims that some officials were acting as “adults in the room” and frustrating Trump from following through on his “worst inclinations.” That’s subversion and obstruction. In fact, if true, it’s treason. The op-ed described a secret inside effort to protect the country from Trump’s “misguided impulses,” and claimed, “there were early whispers within the Cabinet of invoking the 25th amendment” to have the president removed from office. First off, I don’t believe that. I do however believe there are enemies from within that are trying to take Trump down. The 25th Amendment allows the vice president to take over if the commander-in-chief is “unable to discharge the powers and duties of his office.” President Trump and others are right in calling for the New York Times to out the author here. Many in Trump’s orbit have denied writing it, but we need to know who this coward is. He or she should grow a set and own up to this. Eventually, it will come out. The Times said publishing the essay anonymously was “the only way to deliver an important perspective” to its readers. No… they are protecting a turncoat which makes them complicit in treason. “What kind of a crisis do we have if senior officials believe that the president can’t do his job and then refuse to follow the rules that have been laid down in the Constitution?” Warren added to CNN. “They can’t have it both ways. 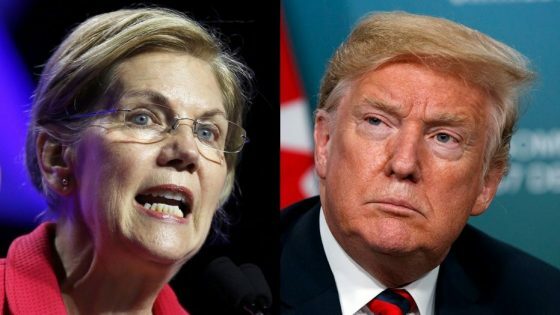 Either they think that the president is not capable of doing his job in which case they follow the rules in the Constitution, or they feel that the president is capable of doing his job, in which case they follow what the president tells them to do.” Warren is trying to appear presidential and take a magical high road here. It’s bitingly dumb. This is obviously a setup and a planned one utilizing the 25th Amendment to try and remove Trump or to render him incapable of doing anything as president. The left couldn’t use the mantra that Trump is crazy, so now they want to say he can’t do his job (because of the left’s minions and machinations), so he has to go. Except for the 25th Amendment to work, Pence would have to sign off on it. NEVER. GOING. TO. HAPPEN. And if they keep this up, the Democrats are going to usher in a full-blown civil war. Warren has since tweeted her statements out to her followers and is urging them to sign up on her campaign website to tell the Trump cabinet to invoke the 25th Amendment if Trump can’t fulfill his presidential duties. This is so stupid and so blatant it takes my breath away. She keeps claiming she is not running for the presidency, but she obviously is. She released 10 years’ worth of tax returns recently, laying the groundwork for a potential presidential run against Trump in 2020. Pocahontas speaks with forked Marxist tongue and she’s positioning herself to lead this coup. Bugger off, a pork of assness.